Carrie married a man named James Hughes. 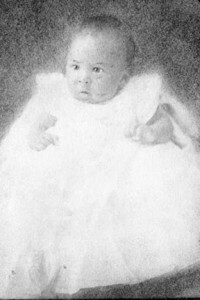 They had a son, Langston, in 1902. James was a lawyer. But he was not allowed to work as a lawyer because he was black. James was fed up with racism. So he left the USA. He left Carrie and Langston behind. Carrie had to move away to find work. She left Langston with his grandmother, Mary. They did not have much money. They still had to live with racism. But Mary told Langston many stories. She told him about his grandfather, Charles. These stories made Langston feel proud of who he was. When Mary died, Langston missed her stories. His mother was always at work. He was on his own a lot. He turned to books. He turned to poems. One day, he began to write his own poems. He turned his sad feelings into beautiful words. The poem “Mother to Son” is about a mother telling her son to keep going in hard times. See Chapter 4 in BC Reads: Adult Literacy Fundamental English – Course Pack 2. Langston Hughes 1902 is in the public domain. Chapter 4 by Shantel Ivits is licensed under a Creative Commons Attribution 4.0 International License, except where otherwise noted.